Art House is looking for 1,000 people from around the world to receive 1000 disposable cameras. They'll mail you the camera for to you to document your life in 24 exposures and then you simply send them back the prints. Not only will they have an exhibition in Atlanta, but they say that they will also travel to the city with the most participants. The exhibition will be home to 24,000 photographs of 1,000 peoples lives all over the world. For more information on the project go to this website. Postmark Deadline: September 1st 2009. Two tri-plex lofts and a one bedroom filled with artwork in all mediums. Two Washington DC collectors will be placing works from their collection on the secondary market for the first time. Katherine Mann is about to have her MFA exhibit at MICA this coming Friday, April 24 from 5-7PM (Details later this week). 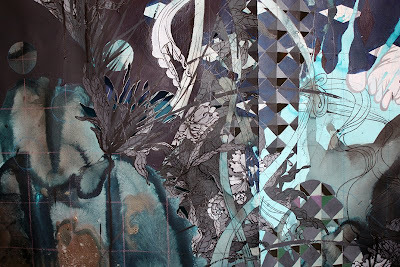 She writes about her work that her "paintings depict ever-changing fantasy worlds where blood cells, rainforests and coral reefs collide and intertwine. Each piece functions as a man-sized porthole into a landscape alive with minute details, patterns and interlocking systems. This is achieved through the conglomeration of minutia piled and cobbled together to create larger, overarching systems that define the whole painting. I work with ambiguous shapes that could function as elements in radically different environments in the real world—a scabby circular shape could be a marsh object covered with barnacles, a white blood cell, or a cratered moon." Join Amber Kerr-Allison, Paintings Conservator and Lunder Conservation Fellow at the Smithsonian American Art Museum, for a gallery talk where she discusses the conservation treatments of several paintings in preparation for the Smithsonian American Art Museum's exhibition 1934: A New Deal for Artists, currently on exhibition through January 2010. Learn more about the paintings themselves as you become acquainted with the techniques, methodology, and tools used by conservators in the treatment and care of the collection. Ms. Kerr-Allison will be joined by curator Ann Prentice Wagner. In tandem, they will explore the technical and visual components of the artwork, elaborate on the historical context of this period, and dialogue about collaboration between curators and conservators. Thursday, April 23, 2:00 p.m. Meet at the entrance of the 1934 exhibition.